Pokhara: An authorized service center of Samsung mobile for Gandaki and Dhawalagiri region has been commenced in Open House Complex Pokhara. The newly formed service center is comprehensive and facility added outlet of previous one which was being run in Mahendrapul Bazaar of Pokhara. 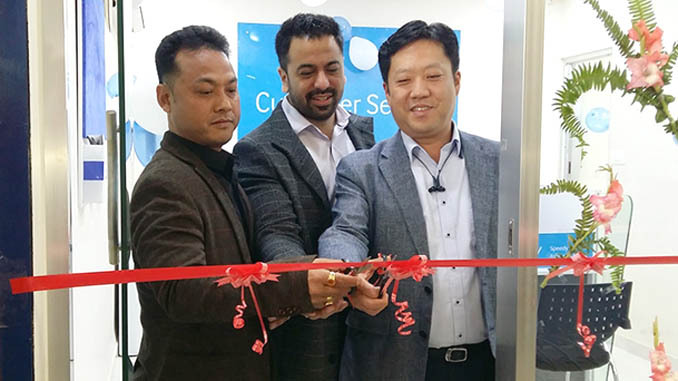 The center was jointly inaugurated by IMS CEO Dikesh Malhotra and Worldwide Connection Pokhara’s Managing Director Sushil Kumar Gurung in a formal small ceremony today. IMS is an authorized distributor of Samsung mobile in Nepal, while Worldwide Connection is responsible for Gandaki Dhawalagiri region for same purpose. According to MD Gurung, the motive behind the establishment of service center is to serve Samsung customers even after the selling of the products. Gurung further added that the Samsung’s market in Pokhara region is very positive and according to him, the center wishes to provide effective and satisfactory service to Samsung customers. Hi Amrit, thanks for your comment but we have already added our contact number in the footer of this website. You can again surf the site.